Built in the early 1930s, Kidd Field has been home to numerous All-Americans, national champions, national record-holders and Olympians. 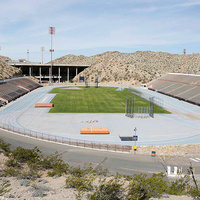 Named after UTEP (then Texas College of Mines and Metallurgy) professor and athletic booster John W. Kidd, the facility was shared with the UTEP football team until 1962, when the facility became sole home to the track and field team. The track features an eight-lane Mondo Track, the same surface used for the 2004 Athens Olympic Games. The track was made possible by generous donations from Wayne and Russ Vandenburg of EPT Management and Mark Fry. The track was dedicated in former Miner legend Larry K. Durham's name. His contribution gave Kidd Field a makeover in 2011, and it was dedicated in his name in April 2012. A state-of-the-art Daktronics video board was added in January of 2008. The 9x15-foot LED video display plants fans right into the action on the track, providing graphics and video elements that display real-time highlights throughout a meet. The lit facility also houses throws and jumps arenas, making Kidd Field one of the top track-only complexes in the country.